The first case is a very simple one involving a “Sandy Hook truther”. These days the term “truther” has been extended to include any conspiracy theorist who doubts the official explanation of any news event. One of the more ridiculous versions of this are people who claim the horrible school shooting at Sandy Hook Elementary in Newtown, Connecticut never happened – that it was entirely faked by the government as some sort of ploy to rush in gun control legislation – or something. Like many conspiracy theories, it makes little sense. Aside from being idiotic, the Sandy Hook truthers have made a nuisance of themselves by actually harassing the families of victims. One decided to steal memorial signs placed by family members, and send photos of the stolen signs to a site called The Daily Banter, which reported on it. Upon closer examination the photos supplied by the anonymous tipster appeared to be unaltered iPhone photos, loaded with meta-data. This meta-data includes the location where the photo was taken, which is why there is a location privacy setting for most camera applications used on the iPhone (see prompt at left). It turns out the photos that we received were loaded with metadata, including geotags, which led Stonington to contact Herndon, where many of the pictures were apparently taken. Police there tracked the geotags to the home seen in the photos we posted last week, which was actually a small unit rented by someone named Alan J. Truelove. They obtained a warrant and this morning arrested Truelove, the father of the man suspected of being the actual sign thief, Andrew David Truelove. In the latest episode of the excellent (and very often hilarious) Skeptics with a K podcast, Mike Hall has a go at debunking the latest viral nonsense from 9/11 truthers. This involves some slow motion footage of the second plane (Flight 175) hitting the World Trade Center on September 11, 2001. I’ll not embed it here, but if you are comfortable with viewing this footage again you can follow that link. The claim being made is that as the plane approaches the south tower, its left wing appears to pass behind a building that is “clearly behind the south World Trade Center tower.” The narrator claims this is evidence of a “layering CGI glitch,” and proof that the footage is computer generated. And casual examination of the footage does seem to reveal some oddity around that part of the footage. (Those who follow 9/11 Truth stuff more closely will know this is not an entirely new claim. An earlier version of this footage made the rounds last September too). A number of skeptics including Steve Novella took a stab at this footage, most getting only part of the debunk correct. But Mike manages to completely destroy the video, using the 3D features of Apple maps and his knowledge of how digital video encoding tools work. 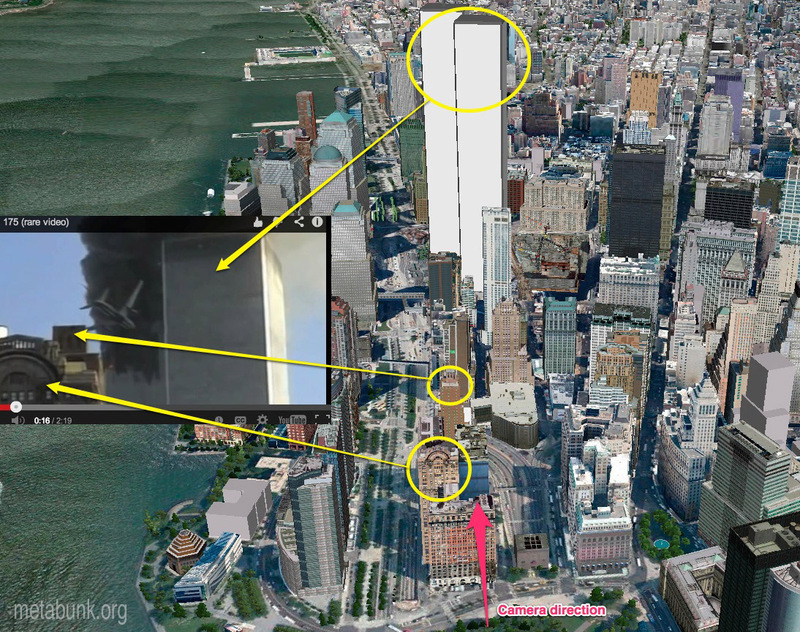 As in many good skeptical investigations, Mike goes right to the premise on which the claim of a video glitch is based – that the building on the left in the footage is “clearly behind” the WTC. As we’ve seen so many times before, there’s no point addressing a claim that is based on a false premise. So check those premises! By using the flyover feature of Apple Maps (also available in other products such as Nokia Maps and Google Earth) he was able to determine where that building actually is located. After only a few seconds I was able to positively identify the building with the arch as the annex of the Whitehall building located at 26 Washington Street in lower Manhattan. This is a 31-story building skyscraper built as an extension to the main Whitehall Building between 1908 and 1910. Behind this at 28 Washington Street is the Downtown Club building, which was (until September 2001) the home to a private social club called the Downtown Athletic Club….It is the Downtown Club building that the wingtip of Flight 175 appears to fly behind. The Downtown Club building is five or six blocks, almost half a mile closer to the camera than the south tower of the World Trade Center! (Slight correction: the Downtown Club building’s correct address 20 West Street as the front door faces the opposite side of the block). Another UK skeptic Myles Power also used the same tools to reach the same conclusion, which he demonstrates in this blog post (including the flyover screenshot duplicated here). Mike Hall goes on to discuss the technical details (involving the mathematical encoding of MPEG video) of why parts of the footage like this would naturally seem to look a bit glitchy. But he doesn’t leave it there. Not satisfied with merely examining the premise that the building is in the background, he backs up yet another step. What about the premise inherent in the very first like of the narration – that this is a “super slow motion” version of the Michael Hezarkhani footage of the disaster? How could a someone visiting New York, shooting news events using a consumer-grade video camera, have managed to capture such footage, normally done with special high speed cameras (like we see on Mythbusters). More interesting, however is that Hezarkhani’s original footage is not in slow motion…. So how does that work?…. It’s because this rare super slow motion video isn’t real slow motion – it’s motion interpolated video. That’s where you take a clip, you feed it into a computer, and you ask the computer to invent new frames between the original ones…. To get the super slow motion effect seen on this video, the majority of the frames would have to be computer interpolations from the original footage! …. I estimate over 90% of the frames in this video are actually interpolations – they’re inventions, they’re computer generated. In other words it’s no wonder that we’re seeing exaggerated MPEG artifacts and sundry other nonsense on this video. It’s because this footage is actually CGI! It’s not by Michael Hezarkhani, and it’s not by the news media or by some shadowy government conspiracy. It’s by whichever guy fed this footage into something like RealViz Retimer or Twixtor in order to slow it down to get a better look. There are more details in the podcast, please go ahead and listen to the whole thing. Nice job, Mike Hall and Myles Power for quickly negating this new copy of a very old video, which was going viral. Blog resources for further research include FourAndSix blog, the Storyful blog and the photography category of Exposing PsuedoAstronomy. So clearly a lesson here is that being up to speed with the latest in photo and video technology (and other technology such as consumer maps) provides great opportunities to create skeptical wins. Another lesson here: truthers aren’t, in general, very bright. In defence of my claim that the Downtown Club building is at 28 Washington Street, I offer exhibit A: http://manhattan.tlechildcare.com/. This is the website of The Learning Experience “children’s academy” – a daycare centre based in the Downtown Club building, which gives its address as 28 Washington Street. I assume there are a couple of routes into the building then? Could well be – it is a large building. Yup, I looked on Google Street View, it’s difficult to see now because the current photos were taken during a construction project that has scaffolding blocking both sidewalks. But it appears there are entrances to the building on both sides of the block – I assume the childcare and other businesses on the low levels use the Washington St. side to enter, and the residents of the upper floors of the building use the entrance on the other side on West St.
People went to great lengths to argue that the EXIF was correct, even though it was obviously fake. A friend of mine wrote a little web-app to “Diegoize” any photo in an undetectable manner. Nice! Great links, thanks for posting them. Fascinating science about photography. I find it interesting that the video CGI programs fill in the blanks in slow motion video in a similar way that the brain fills in the blanks in information we process. And in both cases, we can be deceived into believing something is real when it is not. Great point Glenn! Really made me question what is real and what is not beyond the conspiracy theories.